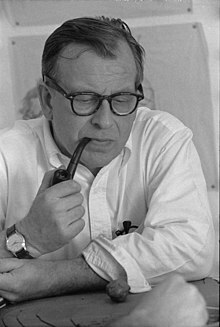 Eero Saarinen (Finnish pronunciation: [ˈeːro ˈsɑːrinen]) (August 20, 1910 – September 1, 1961) was a Finnish American architect and industrial designer noted for his neo-futuristic style. 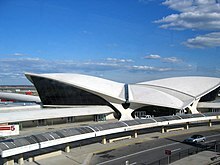 Saarinen is known for designing the Washington Dulles International Airport outside Washington, D.C., the TWA Flight Center in New York City, and the Gateway Arch in St. Louis, Missouri. He was the son of noted Finnish architect Eliel Saarinen. Eero Saarinen was born on August 20, 1910, to Finnish architect Eliel Saarinen and his second wife, Louise, on his father's 37th birthday. They immigrated to the United States in 1923, when Eero was thirteen. He grew up in Bloomfield Hills, Michigan, where his father taught and was dean of the Cranbrook Academy of Art, and he took courses in sculpture and furniture design there. He had a close relationship with fellow students Charles and Ray Eames, and became good friends with Florence Knoll (née Schust). Saarinen began studies in sculpture at the Académie de la Grande Chaumière in Paris, France, in September 1929. He then went on to study at the Yale School of Architecture, completing his studies in 1934. Subsequently, he toured Europe and North Africa for a year and returned for a year to his native Finland. After his tour of Europe and North Africa, Saarinen returned to Cranbrook to work for his father and teach at the academy. The firm was "Saarinen, Swansen and Associates", headed by Eliel Saarinen and Robert Swansen from the late 1930s until Eliel's death in 1950. The firm was located in Bloomfield Hills, Michigan, until 1961 when the practice was moved to Hamden, Connecticut. Saarinen first received critical recognition, while still working for his father, for a chair designed together with Charles Eames for the "Organic Design in Home Furnishings" competition in 1940, for which they received first prize. The "Tulip Chair", like all other Saarinen chairs, was taken into production by the Knoll furniture company, founded by Hans Knoll, who married Saarinen family friend Florence (Schust) Knoll. 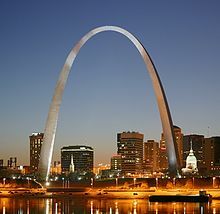 Further attention came also while Saarinen was still working for his father, when he took first prize in the 1948 competition for the design of the Gateway Arch National Park (then known as the Jefferson National Expansion Memorial) in St. Louis. The memorial wasn't completed until the 1960s. The competition award was mistakenly sent to his father because both he and his father had entered the competition separately. When the Committee sent out the Letter stating Saarinen had Won the Gateway Arch Competition the Letter was mistakenly addressed to his Father. During his long association with Knoll he designed many important pieces of furniture including the "Grasshopper" lounge chair and ottoman (1946), the "Womb" chair and ottoman (1948), the "Womb" settee (1950), side and arm chairs (1948–1950), and his most famous "Tulip" or "Pedestal" group (1956), which featured side and arm chairs, dining, coffee and side tables, as well as a stool. All of these designs were highly successful except for the "Grasshopper" lounge chair, which, although in production through 1965, was not a big success. One of Saarinen's earliest works to receive international acclaim is the Crow Island School in Winnetka, Illinois (1940). The first major work by Saarinen, in collaboration with his father, was the General Motors Technical Center in Warren, Michigan, which follows the rationalist design Miesian style, incorporating steel and glass, but with the added accent of panels in two shades of blue. The GM Technical Center was constructed in 1956, with Saarinen using models, which allowed him to share his ideas with others, and gather input from other professionals. With the success of the scheme, Saarinen was then invited by other major American corporations such as John Deere, IBM, and CBS to design their new headquarters or other major corporate buildings. Despite their rationality, however, the interiors usually contained more dramatic sweeping staircases, as well as furniture designed by Saarinen, such as the Pedestal Series. In the 1950s he began to receive more commissions from American universities for campus designs and individual buildings; these include the Noyes dormitory at Vassar, Hill College House at the University of Pennsylvania, as well as an ice rink, Ingalls Rink, Ezra Stiles & Morse Colleges at Yale University, the MIT Chapel and neighboring Kresge Auditorium at MIT and the University of Chicago Law School building and grounds. Saarinen served on the jury for the Sydney Opera House commission in 1957 and was crucial in the selection of the now internationally known design by Jørn Utzon. A jury which did not include Saarinen had discarded Utzon's design in the first round; Saarinen reviewed the discarded designs, recognized a quality in Utzon's design, and ultimately assured the commission of Utzon. After his father's death in July 1950, Saarinen founded his own architect's office, "Eero Saarinen and Associates". He was the principal partner from 1950 until his death in 1961. Under Eero Saarinen, the firm carried out many of its most important works, including the Bell Labs Holmdel Complex in Holmdel Township, New Jersey, Gateway Arch National Park (including the Gateway Arch) in St. Louis, Missouri, the Miller House in Columbus, Indiana, the TWA Flight Center at John F. Kennedy International Airport that he worked on with Charles J. Parise, the main terminal of Washington Dulles International Airport, the new East Air Terminal of the old Athens airport in Greece, which opened in 1967, etc. Many of these projects use catenary curves in their structural designs. In 1949-1950, Saarinen was hired by the then-new Brandeis University to create a master plan for the campus. Saarinen's plan A Foundation for Learning: Planning the Campus of Brandeis University (1949; second edition 1951), developed with Matthew Nowicki, called for a central academic complex surrounded by residential quadrangles along a peripheral road. The plan was never built but was useful in attracting donors. Saarinen did build a few residential structures on the campus, including Ridgewood Quadrangle (1950), Sherman Student Center (1952) and Shapiro Dormitory at Hamilton Quadrangle (1952). These have all been either demolished or extensively remodeled. Eero also designed the Embassy of the United States, London, which opened in 1960, and the Embassy of the United States, Oslo completed in 1959. Eero also worked with his father, mother and sister designing elements of the Cranbrook campus in Bloomfield Hills, Michigan, including the Cranbrook School, Kingswood School, the Cranbrook Art Academy and the Cranbrook Science Institute. The younger Saarinen's leaded glass designs are a prominent feature of these buildings throughout the campus. Eero Saarinen was elected a Fellow of the American Institute of Architects in 1952. He was elected a member of the National Institute of Arts and Letters in 1954. In 1962, he was posthumously awarded a gold medal by the American Institute of Architects. 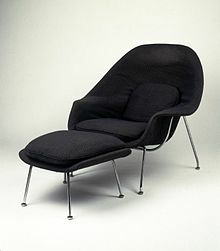 In 1940, he received two first prizes together with Charles Eames in furniture design competition of MoMA. In 1948, he won the first prize in Jefferson national monument competition. Boston Arts festival in 1953 gave him Grand architectural award. He received the First Honor award of the American Institute of Architects twice, in 1955 and 1956, and their gold medal in 1962. In 1965 he got the first prize in US Embassy competition in London. Saarinen became a naturalized citizen of the United States in 1940. Saarinen married sculptor Lilian Swann in 1939, with whom he had two children, Eric and Susan. The marriage ended in divorce in 1954. That same year Saarinen married Aline Bernstein Louchheim, an art critic at The New York Times, with whom he had a son, Eames, named after Saarinen's collaborator Charles Eames. Saarinen died on September 1, 1961, at the age of 51 while undergoing an operation for a brain tumor. He was in Ann Arbor, Michigan, overseeing the completion of a new music building for the University of Michigan School of Music, Theatre & Dance. He is buried at White Chapel Memorial Cemetery, in Troy, Michigan. The papers of Aline and Eero Saarinen, from 1906-1977, were donated in 1973 to the Archives of American Art, Smithsonian Institution (by Charles Alan, Aline Saarinen's brother and executor of her estate). In 2006, the bulk of these primary source documents on the couple were digitized and posted online on the Archives' website. An exhibition of Saarinen's work, Eero Saarinen: Shaping the Future, was organized by the Finnish Cultural Institute in New York in collaboration with Yale School of Architecture, the National Building Museum, and the Museum of Finnish Architecture. The exhibition toured in Europe and the US from 2006 to 2010. From May to August 2008, the exhibit was at the National Building Museum in Washington, DC. The exhibition was accompanied by the book Eero Saarinen. Shaping the Future. In 2016 Eero Saarinen: The Architect Who Saw the Future, a film about Saarinen (co-produced by his son Eric), premiered on the PBS American Masters series. ^ a b c Staff of Arkkitehtuurimuseo (2012). "Eero Saarinen". MFA.fi (in Finnish). Helsinki, FIN: Arkkitehtuurimuseo [Museum of Finnish Architecture]. Retrieved December 28, 2016. ^ a b Staff of Arkkitehtuurimuseo (2012). "Eliel Saarinen". MFA.fi (in Finnish). Helsinki, FIN: Arkkitehtuurimuseo [Museum of Finnish Architecture]. Retrieved December 28, 2016. ^ Dorman, John L. (2017-10-06). "Eero Saarinen's Michigan". The New York Times. ISSN 0362-4331. Retrieved 2018-02-18. ^ Still, Sylvia (2016). "Eero Saarinen". Art-Directory.info. Muenchen, DEU: Art Directory GmbH. Retrieved December 28, 2016. ^ "Experts Pick Best-Designed Products of Modern Times" (PDF). 22: New York Times. March 31, 1959. Retrieved 22 March 2017. ^ a b c "The Role of Eero Saarinen". Building Brandeis. Brandeis University Library. Retrieved 23 February 2019. ^ a b Bernstein, Gerald S. (1999). Building a Campus: An Architectural Celebration of Brandeis University's 50th Anniversary. Waltham, Massachusetts: Brandeis University Office of Publications. pp. 25–26. ISBN 0-9620545-1 Check |isbn= value: length (help). ^ Marefat, Mina (October 25, 2010). "Revealed: Eero Saarinen's Secret Wartime Role in the White House". The Architectural Review. Retrieved December 28, 2016. ^ Middleton, William D. (2012). On Railways Far Away. Indiana University Press. p. 96. ISBN 9780253005946. ^ "Five Elected to Arts Institute" (PDF). New York Times. February 10, 1954. p. 36. Retrieved 22 March 2017. ^ American Institute of Architects. "Gold Medal-AIA". AIA. Retrieved 22 March 2017. ^ Emanuel, Muriel (2016). Contemporary Architects. Springer. p. 695. ISBN 9781349041848. ^ "The LOC.GOV Wise Guide : An Architecture of Plurality". www.loc.gov. ^ Sean Flynn. "All in the family". NewportRI.com | News and information for Newport, Rhode Island. The Newport Daily News. ^ "Saarinen, Aline B. (Aline Bernstein), 1914-1972". socialarchive.iath.virginia.edu. ^ "The Eero Saarinen Masterpiece No One Sees: IBM Manufacturing and Training Facility in Rochester, Minnesota". Untapped Cities. 20 August 2013. ^ AAA Staff (December 28, 2016). "Aline and Eero Saarinen papers, 1906-1977". Archives of American Art (AAA). Washington, DC: Smithsonian Institution. Retrieved December 28, 2016. ^ Meehan, Jennifer. "A Finding Aid to the Aline and Eero Saarinen Papers, 1906-1977, in the Archives of American Art". Archives of American Art. Smithsonian Institution. Retrieved 2018-01-15. ^ "Aline and Eero Saarinen papers, 1906-1977". Smithsonian Institution. Retrieved 2017-11-07. ^ Arkkitehtuurimuseo Staff (October 1, 2006). "Eero Saarinen: Shaping the Future". MFA.fi. Helsinki, FIN: Arkkitehtuurimuseo [Museum of Finnish Architecture]. Retrieved December 28, 2016. ^ NBM Staff (May 3, 2008). "Eero Saarinen: Shaping the Future". NBM.org. Washington, DC: National Building Museum (NBM). Archived from the original on December 28, 2016. Retrieved December 28, 2016. Saarinen, Eero (1962). Saarinen, Aline B., ed. Eero Saarinen on His Work: A Selection of Buildings Dating from 1947 to 1964 with Statements by the Architect. New Haven: Yale University Press. Retrieved December 28, 2016. A&E (1997). America's Castles: Newspaper Moguls. New York: A&E Network. ASIN B000FKP26M. Archived from the original (television series episode) on December 28, 2016. Retrieved December 28, 2016. Episode featuring the Cranbrook House and Gardens. Roman, Antonio (2003). Eero Saarinen. New York: Princeton Architectural Press. ISBN 978-1-56898-340-0. Risen, Clay (November 7, 2004). "Saarinen rising: A Much-Maligned Modernist Finally Gets His Due". Boston.com. Retrieved December 28, 2016. Merkel, Jayne (2005). Eero Saarinen. London: Phaidon Press. ISBN 978-0-7148-4277-6. Pelkonen, Eeva-Liisa (2006). Eero Saarinen. New Haven: Yale University Press. ISBN 978-0-300-11282-5. Serraino, Pierluigi (2006). Saarinen, 1910–1961: a Structural Expressionist. Köln: Taschen. ISBN 978-3-8228-3645-3. Knight, Richard (2008). Saarinen’s Quest, A Memoir. San Francisco: William Stout Publishers. ISBN 978-0-9746214-4-9. Santala, Susanna (2015). Laboratory for a New Architecture: Airport Terminal, Eero Saarinen and the Historiography of Modern Architecture (Ph.D. thesis). Helsinki: University of Helsinki. ISBN 978-951-51-0993-4. Wikimedia Commons has media related to Eero Saarinen. EMFURN Staff (November 15, 2014). "Your Guide to Vintage Danish Mid Century Modern Furniture & Designers" (commercial sales blog). EMFURN.com. Retrieved December 28, 2016. Commercial furniture sales blog mentioning the Womb chair. "Trans World Airlines Unit Terminal Building, New York International Airport, architectural drawings, 1958-1961". columbia.edu. Retrieved December 28, 2016. Held by the Department of Drawings & Archives, Avery Architectural and Fine Arts Library, Columbia University. "Lines of Authority". Retrieved December 28, 2016 – via www.time.com. "UM School of Music, Theatre & Dance – About Us – Facilities". umich.edu. Retrieved December 28, 2016. Earl V. Moore Building by Eero Saarinen. "Prints & Photographs Online Catalog". loc.gov. Retrieved December 28, 2016. Balthazar Korab Collection at the Library of Congress. "Saarinen's Village". palni.edu. Retrieved December 28, 2016. The Concordia Campus Through Time. Digital image database. [dead link] Yale University Library. Containing 1296 images and drawings from Saarinen's archives. Finding aid to the Eero Saarinen Collection at Manuscripts and Archives. [dead link] Yale University Library. "tulip-chair.org". Archived from the original on December 18, 2014. Retrieved December 28, 2016. Saarinen Tulip Chair. Barbano, Michael. "Eero Saarinen: Shaping The Future". eerosaarinen.net. Retrieved December 28, 2016. Eero Saarinen Exhibitions at Cranbrook Art Museum. "Eero Saarinen: Shaping Community". nbm.org. Archived from the original on August 11, 2016. Retrieved December 28, 2016. Blueprints, Winter 2007-08.